Instructions explain how to make a word cloud. This is a fun activity for kids. 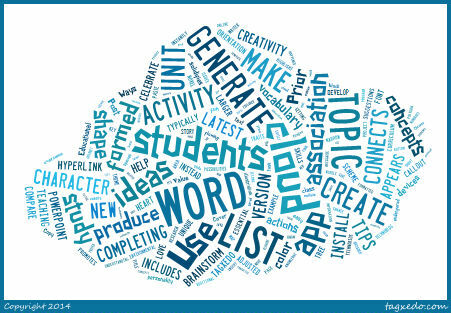 There are many free online sites that allow students to create their own word cloud. One of my favorites is WordClouds. 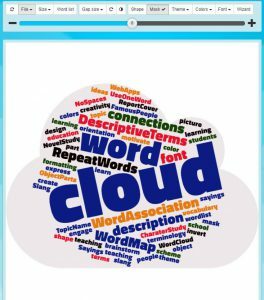 If you need ideas for integrating word clouds into curriculum refer to the blog post 5 Ways your Students can Use Word Clouds. A word cloud is a picture made from words about a topic. The more important a word, the larger it appears. Typically, the words are arranged randomly. 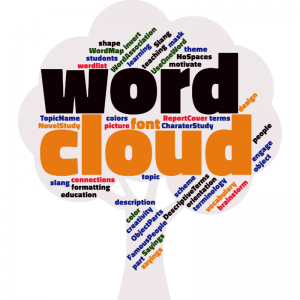 Most word clouds can be formatted to set the font, color, and shape. This transforms the word cloud into art. Make it BIG: To have the word appear larger in the word cloud, repeat it many times in the word list. Avoid using Spaces Between Words: If the item is a phrase or person’s name, you must write it as ONE WORD with NO SPACES. You can use capital letters or underscores to make the information clear. For example TonyHawk or Tony_Hawk. Open Microsoft Word, Notepad, or a similar word processing program. Type words related to your topic. Save the file as word cloud. If using Microsoft Word, change the file type to Plain Text or .txt. When a File Conversion message is displayed, click OK.
Click File. Select Open text file. Locate file and click Open. When finished, click File. Select Save as PNG. A few months ago several teachers approached me and asked it I would assist in teaching a leadership unit. The school was incorporating a leadership model inspired by the book The Leader in Me by Stephen R. Covey. I developed several technology-based activities that would help students recognize their leadership strengths, as well as apply leadership skills to complete various tasks. At first I was only working with Grade 5 and 6 students. However, this expanded to working with a Grade 2 class as well. I was hoping to take some of the teaching ideas and transform them into a project called TechnoLeader. I thought the final product would be perfect for a leadership workshop. I don’t know if this project will ever be published. It has been temporarily shelved as I have had to move onto other more “technology-focused” projects. Maybe it will come to light one day. The project is half-written. In addition to the computer-based tasks, it also includes leadership badges, fun games, and collaborative activities. In the meantime, I thought I would post the first leadership activity students complete in TechnoLeader – it is a Leadership Quiz. The instructional goal of the quiz is to have students recognize that they are leaders. Once they complete this activity, the next assignment has students transform their leadership traits (traits from the always column in the quiz) into an “I am a Leader” Word Cloud using Tagxedo. I taught this activity to several classes. The students surprised me with their insight. Maybe you could teach it too! Sometimes when you imagine a leader, you think of a CEO of a business or the principal of a school. You may not think that you are a leader….but you are! You lead YOURSELF in the choices that you make. You lead BY EXAMPLE acting as a role model. You lead OTHERS by guiding them towards a goal. Complete the activities to discover what makes you a great leader. You lead yourself each day with the choices that you make. You can make a good choice and lead yourself towards a positive outcome. You can make a poor choice and lead yourself towards a negative outcome. Great leaders make good personal choices. What choice did you make in the last month that resulted in something good happening? What choice did you make in the last month that resulted in something bad happening? People look to you for leadership and imitate your actions. You are a role model. You lead BY EXAMPLE acting as a role model. A role model is a person whose behavior, attitude, or accomplishments are copied by others. It is important to realize that other people, especially those younger than you, look up to you for guidance and as a source of inspiration. Being a role model for others is a big responsibility. What is one thing that you do such as a habit, skill, or ability that you think others would benefit from copying? Leadership involves guiding others to achieve a goal. You are a leader. You provide direction, share advice, and help people work together. You can lead others to achieve wonderful things or you can lead others to achieve terrible things. Great leaders lead others to accomplish worthy goals. Describe a time when you had to lead others to accomplish a goal either at school, home, or as part of a team or club. Leaders are self-aware. This means they understand their strengths and weaknesses. Take the quiz to discover the traits that make you a great leader. For each statement, circle if you always, sometimes, or never show this trait. Look at the always column. Those are traits that make you a good leader. Look at the sometimes column. Pick one trait you would like to work on so that you did it always. Draw a star * beside it. I love to make word clouds with my students. A word cloud is a picture formed from a list of words. Typically, the more often a word appears in the list, the larger or more frequent it will be in the word cloud. The word cloud is not necessarily shaped like a cloud. Instead, depending on the app, the image can be a heart, callout, tree, or many more. The font, color scheme, and orientation can be adjusted to produce a unique design. Novel Study Unit – Character Study: Generate a list of words to describe a character. Include words that describe the character’s appearance, personality traits, and actions. Select a shape and color theme for the word cloud that relates to the story. Report Cover: Copy and paste text from a report into a word cloud list. This image will instantly highlight key concepts. Use the word cloud as an illustration on the title page. Brainstorm Ideas: Complete a word association activity to generate ideas. This task can help students overcome writer’s block by getting creative ideas flowing. It can also help students narrow down an area of study by producing a list of possibilities for research topics (e.g. make a list of endangered species or environmental issues). The TechnoKids technology project TechnoBlog includes a Word Cloud activity. Word Map: Produce a word cloud from a short list of words related to a topic of study. Insert the word cloud into a program such as a PowerPoint. Create a hyperlink from a word that connects to additional information. TIP: An action button or free-form polygon (that is formatted with No Fill) can be used in PowerPoint to create a hyperlink that connects to another slide or a website. Celebrate Learning: Compare two word clouds to recognize a broader understanding of a topic. Prior to teaching a unit, brainstorm a list of words associated with a topic. Post this word cloud in the classroom. Upon completion of the unit, generate a new list of words associated with topic. Compare the two word clouds. What change has happened in students’ knowledge of the topic? Has their vocabulary increased? Do they know more concepts related to the topic? Was it easier to generate the list prior to teaching the unit or after completing the unit? Post the second word cloud in the classroom to celebrate learning. http://www.wordclouds.com/ – Create from a text file. Easy to save. http://www.abcya.com/word_clouds.htm – Use a screen capture app to save image. https://tagul.com/ – Requires you to create an account. http://www.wordle.net – Requires a java plug-in. http://www.tagxedo.com/ – Requires Silverlight and Internet Explorer. If one web browser does not work with the Word Cloud app then try another. It is always a good idea to have multiple browsers installed on your device. Popular options are Internet Explorer, Chrome, and Firefox.